Perfection. 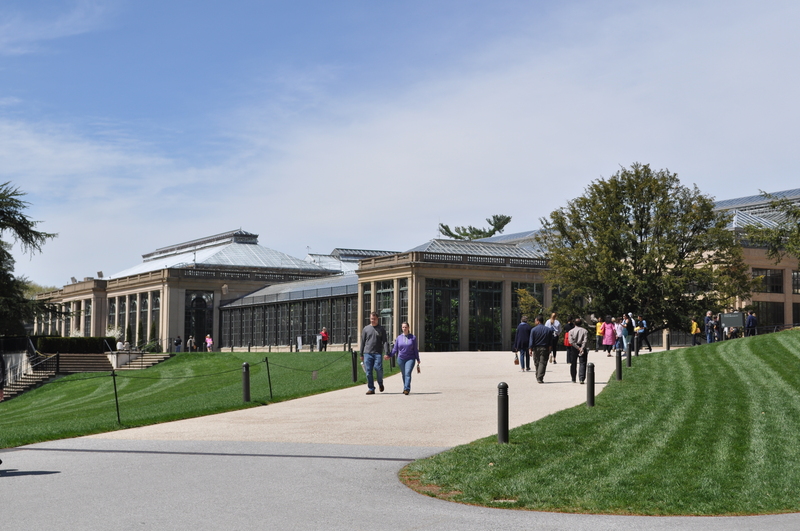 That’s the only way to describe Longwood Gardens. Everything they do is perfect. From the lawn, to the plant selection, employees, timing, and even the bathrooms. PERFECT in every way. If you’ve never been there, this is one of those places that needs to be on your lifelong bucket list. If you have been there, you need to go again. And again. And again. Apparently a million other people per year agree with me. They’ve had at least that many guests annually since 2012 and visitors come from all over the world. To give you a little background about me, in case I haven’t mentioned it before, I’m a plant geek. I have a degree in landscape horticulture and also in plant science. During one of my internships at another local public garden, I got to have a behind the scenes tour of Longwood, so I’ve gotten to go underneath the conservatory, through the greenhouses and have a private tour with their treehouse designer. To say I’m a little passionate about Longwood is an understatement. When I visit Longwood, I experience things as a guest but also have a deeper appreciation for the work that goes in to creating the masterpiece. Just so you know, there is never a bad time of year to visit Longwood. From their Christmas lights, to their orchid extravaganza to the amazing tulip display in the Spring, there’s always something amazing happening. Honestly, you could even spend your entire visit inside the conservatory on a rainy day (I know from experience!) You won’t see everything in one shot for sure, so you will need to prioritize which areas you want to go to. If you’re taking the little ones you will want to do the outdoor children’s garden, the indoor water play garden and probably the tree houses. Make sure you bring a change of clothes for the kiddos in case they go a little overboard (like mine) while enjoying the water features. While you’re in the conservatory, you HAVE to go to the bathroom. Even if you don’t actually need to use it, you need to go there. Trust me. If you plan on being there through lunch time, you can picnic right outside the gardens in the designated area (but not inside) or eat at the café on site. There are kid friendly menu options, but it’s a little on the pricey side. Sometimes convenience wins over budget though, so if you do plan on eating there, make sure you try to get there by 11:30 because by 12, there’s a line out the door on busy weekends. In the same regard, during peak visiting seasons, you may have to purchase your tickets to get in to the garden with a specific entry time. Also note that kids under 4 are free. You can rent strollers, wheelchairs and scooters on site and most of the garden and conservatory is very handicap friendly. Because Longwood is so awesome, they even hand out scavenger hunts to the kids as they enter with certain garden features or outdoor creatures (see what I did there?) to try to find while exploring. 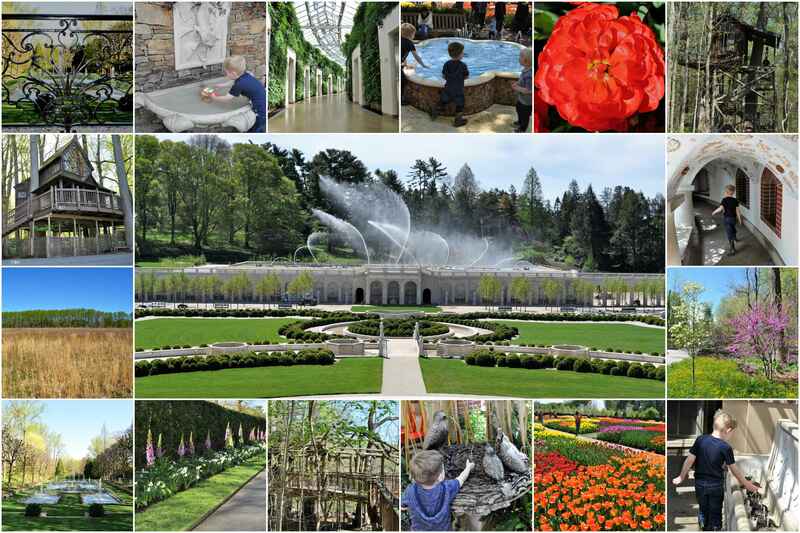 It just so happens that my post about Longwood, coincides nearly perfectly with the grand opening of the newly redesigned Main Fountain Garden on May 27th, 2017. The area has been under construction for THREE YEARS!!! It has to be pretty spectacular after all that. I highly recommend NOT going on that weekend, or maybe even the one after that as it will be mobbed, but is definitely a MUST SEE attraction there. If you’re going to be you’re going to be visiting in the Summer months to see the fountains, make sure you check out the water lily gardens. The giant victoria lilies are my favorite!